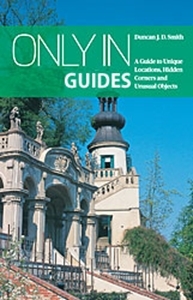 Discover Europe with the 'Only In' Guides, a series of guides from The Urban Explorer. These ground breaking city guides are for independent cultural travellers wishing to escape the crowds and understand cities from different and unusual perspectives. Unique locations, hidden corners and unusual objects. Forgotten cemeteries, unusual museums, hidden courtyards, eccentric characters. Each volume contains a hundred locations and is lavishly illustrated, with 2 fold-out maps and a list of opening times at the back. The Urban Explorer Duncan J. D. Smith is a travel writer, historian and photographer. In his ground breaking 'Only In' Guides he reveals European cities from unique and hidden perspectives. He has travelled across several continents and described his experiences in books, magazines, and online. Born in Sheffield, England in 1960, he studied history and archaeology at university. He is a Fellow of the Royal Geographical Society. by Smith, Duncan J. D.